Dollhouse miniature 17 piece porcelain tea set. White in a classic ribbed design. 1:12 Scale. This is sized for a dollhouse. Lovely tiny ceramic serving set for your doll or dollhouse collection. Pretty floral design. International Priority is FAR superior in many ways, but expensive, I know. 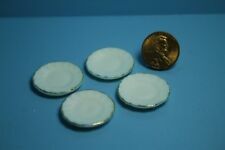 (1950's Dollhouse Miniature China Porcelain. 1) Rorstrand China from Sweden. 2) Marked: France. Has Been Kept in a Locked Cabinet. Dollhouse Miniature Tea Set. This set is White with Gold Trim. Dollys Gallery. 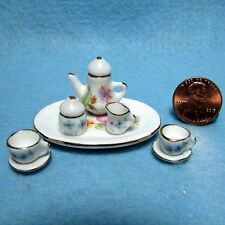 Dollhouse Miniature Tea Set B. This set is Blue and White and Yellow. Dollys Gallery. 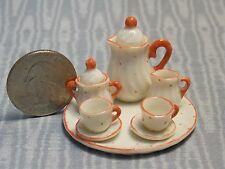 Dollhouse Miniature Tea Set. These are in 1:6 scale aka Barbie Scale. This set is White with a Silver Rim. 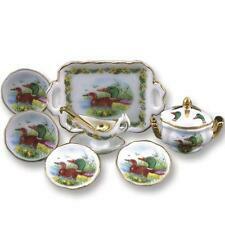 This exquisite porcelain tea cup plate set, suits for any style of dollhouse scene. They can be put in the kitchen, dining-room, or bedroom. Safety Shockproof packaging.Beautiful design and excellent workmanshipExquisite collection for dollsSuit for: 1/6 Miniature DollhouseMaterial: PorcelainColor: White P Rose Flower PatternFor decorative use only, not a toyPlease keep it away from children too youngSize:The diameter of big round plate Approx. 6.7 CM,The diameter of small plate Approx. 1.3cmHeight of tea cup Approx. 2.1cmHeight of tea pot with cover Approx.4.5cmPackage Includes:1 x Tea pot with cover lid1 x Big round plate2 x Tea cups2 x Tea dishes1 x Sugar jar with cover lid1 x Milk ContainerNote: Since the size above is measured by hand, the size of the. This is a coffee service hand-painted by Beate' of Australia. This normally occurs during the weekends. Your patience is appreciated. Miniature cake stand with Victorian girl detail. 1:12 scale. You are viewing a doll house size 14 piece mini China Tea set. THIS SET IS IN VERY GOOD CONDITION . THERE IS NO MAKERS MARK ON THIS ITEM.